Explanation: Why is there a glowing oval over Jupiter's South Pole? Aurora. 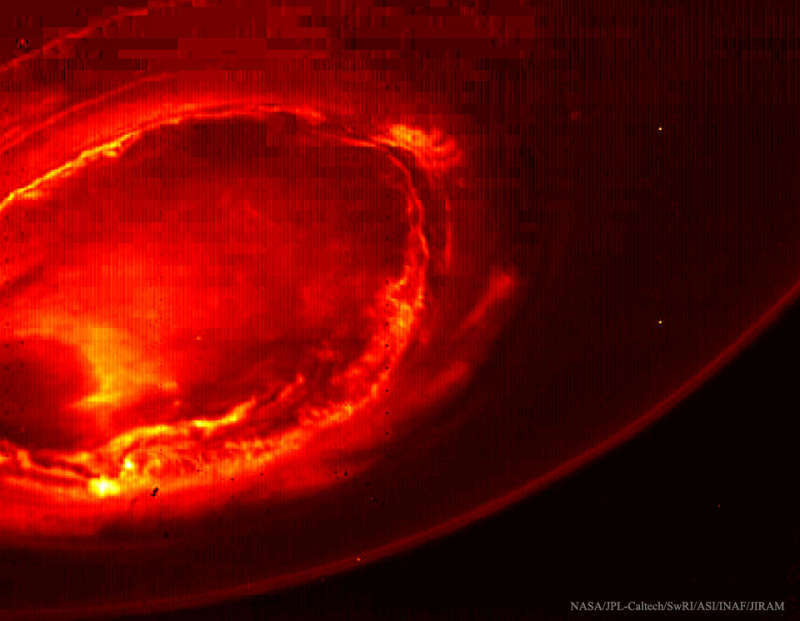 Near the closest part of its first pass near Jupiter in August, NASA's robotic spacecraft Juno captured this dramatic infrared image of a bright auroral ring. Auroras are caused by high energy particles from the Sun interacting with a planet's magnetic field, and ovals around magnetic poles are common. Data from Juno are giving preliminary indications that Jupiter's magnetic field and aurorae are unexpectedly powerful and complex. Unfortunately, a computer glitch caused Juno to go into safe mode during its last pass near the Jovian giant in September. That glitch has now been resolved, making Juno ready for its next pass over Jupiter's cloud tops this coming Sunday.